Website development has come a long way since the early days. The methods and techniques that are used today have grown at a rapid-fire pace. To understand what a web developer does, we must first learn a little bit more about how the whole thing started. Web development is a very broad term used to describe the work involved in developing and serving a website for the Internet or an Intranet. It can range from a simple static page up to highly complex Internet applications and services. Al Gore may have invented the Internet, but it was Tim Berners-Lee who first proposed and prototyped Enquire after he became frustrated with the fact that his data was stored in separate databases. He wanted a human readable way to randomly match different content to various database links of information. He made Enquire to share and keep track of his projects. His concept quickly became the standard by which the folks at CERN stored and shared their information. However, in 1989 he took Enquire a step further when he proposed the Internet-based hypertext markup system (HTML). Berners-Lee wrote HTML, the browser software and the server software in late 1990. He could be considered the first web developer. In the meantime, TCP/IP was being introduced at CERN. Adding the two together made CERN the largest interconnected database site in Europe. In other words, the Internet was born. The hypertext protocol made it possible to create links between various nodes of information for anyone to share. Everyone could access any and all the information they wanted at any time. Moreover, they could do this from anywhere within the CERN complex. This took data sharing between projects to new levels. As you can see a web developer needs wear many hats to do web development these days. There is an ever-growing list of technologies and tools that are available to help them build highly dynamic and interactive websites. Furthermore, a website developer also has to know how to create and deliver applications as a service. This was once traditionally available only on desktop computers. Website software and cloud-based applications allow the end users to interact with the developer’s applications in ways that were once thought impossible. Users can do this from just about any location instead of being tied to a particular workstation. In other words, users can now access their data and use their applications from just about any device they are logged on to. This aspect has dramatically transformed the way we communicate and do business. Examples of this dramatic transformation include websites like eBay and Amazon. They have changed the way consumers locate and purchase goods or services. Even the way we get our entertainment has vastly been improved through website application development. Another dynamic transformation has been the rise of CMS websites and blogs. These types of website platforms have enabled users to better communicate with each other, share thoughts and ideas, and even locate better news and information on an unprecedented level. However, there is more. Networking and marketing have also been positively impacted by recent advancements in application developments. Social media websites like Twitter and Facebook give their users and organizations a platform to engage each other in unique ways. This has made selling on-line more personal. Companies can get instant feedback and consumers can review their products. Services like Dropbox and Google Drive let us store all of our data in one place, but it can be retrieved from any device. All this is changed the way we live and work. A web developer is mainly responsible for programming the code that tells an Internet website how to behave and function. They can also be involved in theming and styling the site. She or he may be the first to format and write the code. Some developers can code both front and backend. They strive to build a website that can be accessed from any browser, including Mozilla Firefox, Google Chrome, Internet Explorer, and others. 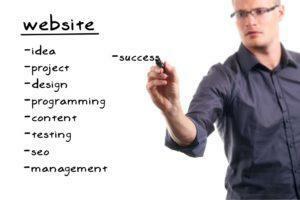 Website developer also creates and maintains websites while keeping the client or the shopper in mind. This usually means they design the site so that clients do not have any difficulty navigating the site. This technique is known in the business as UI/UX. It stands for User Interface and User Experience. The end result is how easily clients can access services and how nice the website looks. Perfecting user-friendly websites can be both demanding and rewarding on many levels. It is an important skill for all web designers to have. Sometimes they will install and write plugins to extend functionality. All this adds up to a more user friendly website. As an example, a client might need a certain form made to easily gather specific information like a user’s e-mail address. Or they may need something more complicated like a job application. Maybe they want to offer a newsletter, or automatically thank customers for their business. Coding these features falls under the hat of the professional web developer. These are just a few of the important tasks that a professional web develper is expected to do. Education requirements may vary between employers, however, many companies are now requiring web developer’s to have a degree in some type of program language. Nevertheless, they will also consider how many years of experience a person has in the lieu of a degree. Sometimes hands on experience is better than a college degree. The position typically requires excellent communication skills. The successful developer will often be part of a team, which means they will have to communicate with their colleagues as well as with their clients. If you plan to become a developer do not slack off on your writing and english skills. You will need them. It is also a good idea to take a communication class. As a side note, having a good understanding of SQL databases is an extra feather in your cap. So is having a firm grasp of website and network security as well as how to build and secure e-commerce applications. These extra skills will go a long way toward helping you snag your dream job. Additional duties may include writing and editing content, webpage layout, defining technical requirements, making graphics, creating backups, and solving coding problems. The projected job growth for web developers through 2022 is 20 percent. This growth is a lot faster than the average for all occupations combined and is primarily due to the demand and popularity of mobile devices and online commerce. The median annual salary for web developers was $70,120. Simply put, the job growth looks great and the starting salaries are not bad. This is definitely a career to consider if you are good at coding. On the pro side anyone who is creative will enjoy working in web development. However, those folks who are less creative will still enjoy the coding aspect. If you like to create a finished product that satisfies people this is the job for you. There is a certain rush that can be felt when the project is completed and people are smiling. Nothing is more rewarding than building a website that looks attractive but is also easy to use,UI/UX is everything. On the negative side you can expect to work a lot of hours. If you do not like multitasking or working on several projects simultaneously this is not the job for you. There will be times when the customers are irate. It seems as though nothing will please them. They can really test your patience. Deadlines will cause stress and at times it feels like you are always behind the eight ball. Nevertheless, once the project is completed and the customer is happy the reward is great. The most important piece of advice is to remain flexible. Web development is a constantly changing ever evolving job. New technologies come and go. New trends come and go. Styles change. One must remain flexible and be ready to switch gears at a moments notice. Another tip is to be a proactive listener. This will help you gather the right details to deliver the finished product on time and on budget. If we listen carefully to the client they will tell us exactly what they are looking for. Likewise, if we listen carefully to our teammates we will know how to fill in the gaps. Being a pro active listener is key to becoming a successful developer. Last but not least, always remember to take stress in stride because at the end of the day all the pieces will naturally fall in to place. Without a doubt the professional web developer has to wear many hats today. They have to be creative yet also be willing to change at a moment’s notice. Nevertheless, the most important thing is to love what you do. Because the end result is the reward.